We’d love your help. 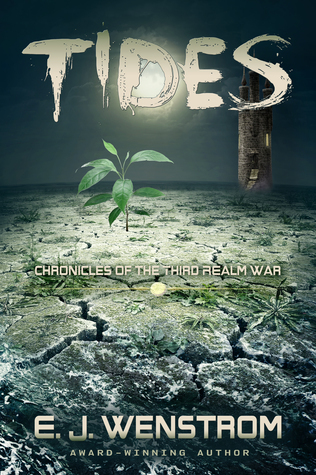 Let us know what’s wrong with this preview of Tides by E.J. Wenstrom. Rona didn't ask to be brought back from the Underworld, and now that she is alive again, she’s angry enough to raise hell. It’s a good thing too, because hell is coming for her. As the realm braces for another round of wars between the Gods and the demigods, Rona’s fate is entangled with the unlikely heroes responsible for bringing her back to life: a golem marked by the Go Rona didn't ask to be brought back from the Underworld, and now that she is alive again, she’s angry enough to raise hell. It’s a good thing too, because hell is coming for her. As the realm braces for another round of wars between the Gods and the demigods, Rona’s fate is entangled with the unlikely heroes responsible for bringing her back to life: a golem marked by the Gods and a man with the touch of destiny upon him. As this questionable duo heads out to face the unknown and stop the realm from destruction, Rona will be damned if they’re going to stop her from coming with them. Together, they embark on a quest to stop the war before it begins. For if they can’t stop the demigods, the entire middle realm of Terath will be torn apart, and everyone in their way destroyed. To ask other readers questions about Tides, please sign up. With each book, Wenstrom gives us more and more depth to her world and characters. Rona comes across realistic-- which is necessary when you deal with gods, demi gods, and different planes of existence. Read this one. Trust me. You'll love it. I read the first novel in this series and was mesmerized by E.J. 's prose, character development and all-around story-telling skills. So, I couldn't wait to read Tides when I saw it was coming out. I was given a free ARC for an honest review on this novel. And I have to tell you, this is like giving candy to a child then asking them to tell you honestly if they liked it. I LOVED IT! Something E.J. does Very well is write Strong Female Protagonists. Rona was one woman no one wanted to mess around w I read the first novel in this series and was mesmerized by E.J. 's prose, character development and all-around story-telling skills. So, I couldn't wait to read Tides when I saw it was coming out. I was given a free ARC for an honest review on this novel. And I have to tell you, this is like giving candy to a child then asking them to tell you honestly if they liked it. I LOVED IT! Something E.J. does Very well is write Strong Female Protagonists. Rona was one woman no one wanted to mess around with. Well, except for the hopelessly dense. She was rescued from the underworld, even though she didn't want to be saved. An angel who is madly obsessed with Rona, haunts her dreams to lure her back to him. All the while, she's trying to strengthen her formerly dead body for a battle against the dangerous army of the dead. She has many odds against her. I couldn't flip the pages fast enough. Every time I thought, "I'm only gonna read 2 chapters tonight..." 2 turned into 3 then 4 then 5. Rona didn’t ask to be brought back from the dead, now she’s upset. What an interesting book that wouldn’t let me put it down until I finished. Received a free book. In 2017, I read over 70 books, this being one of them. Tides was in my top 8 favorites, 1st in its category, for the year. This puts her in literary company with powerhouses in the industry: Michael Connelly, James Patterson, Lawrence Block, John Sandford, CJ Box, Craig Johnson, and even John Steinbeck. E. J. Wenstrom is an award-winning fantasy and science fiction author. Her debut novel, Mud: Chronicles of the Third Realm War, was named FWA's 2016 Book of the Year. When she’s not writing fiction, E. J. drinks coffee, runs, and has long conversations with her dog. Ray Bradbury is her hero.